2018 City Vino Wine Gift Ideas - City Vino, Inc.
Chateau Croix des Rouzes Pomerol 2012 – Merlot-based blend from the esteemed Pomerol region of Bordeaux, France. R.H. Coutier, Champgne Brut Grand Cru Tradition – Delicate bubble with beautiful acidity and French floral Boquete. Elyse Morisoli Vineyard 2012 – Perfect for the Napa Cabernet lover who appreciates “Rutherford Dust”. Ceretto Nebbiolo Barbaresco 2014 – Give the “King of Wines” to the king (or queen) of wine in your life. Ixsir El Ixsir Red Blend 2011 – For the adventurous wine explorer, expand their horizons with a wine from Lebanon. Lemaire Rosé de Saignée- Limité – Perfect for the Champagne aficionado. M Chapoutier Châteaneuf-du-Pape La Bernardine 2014 – From the highly esteemed Chateaneuf-du-Pape region of the Rhone Valley. Scopone Brunello di Montalcino 2011 – Perfect for the Italian food and wine lover. McClelland, Oak Knoll District of Napa Valley Cabernet Sauvignon (2014)– Smooth and rich Napa Cab for those who appreciate robust wines. Domaine William Fevre Chablis Champs Royaux – Connoisseurs of French wines will recognize the distinct minerality and citrus notes that make Chablis unique. Riedel Glasses – The right stemware really does make a difference. We have a glass for almost every wine type. Thibaut-Jannison Xtra Brut Champagne-style sparkler from Virginia, made from 100% Chardonnay. Great additions to round out your holiday gift giving or to bring to a gift swap! AirPop Wine opener – Add some fun and excitement to opening your next bottle of wine! Wine glass charms – Choose from a selection of themed sets or choose your own combination. Wine Chocolates – Yummy Gearharts chocolate mixed with Virginia wines. Wine Jellies – Made with Virginia wines, elevate your PB&J or serve alongside a cheese plate. We have a selection of pre-made gift baskets in different sizes when you need something quick. Or customize your perfect gift. Beautifully packaged, baskets contain food items and assorted goodies. Baskets can hold one to twelve bottles of wine. 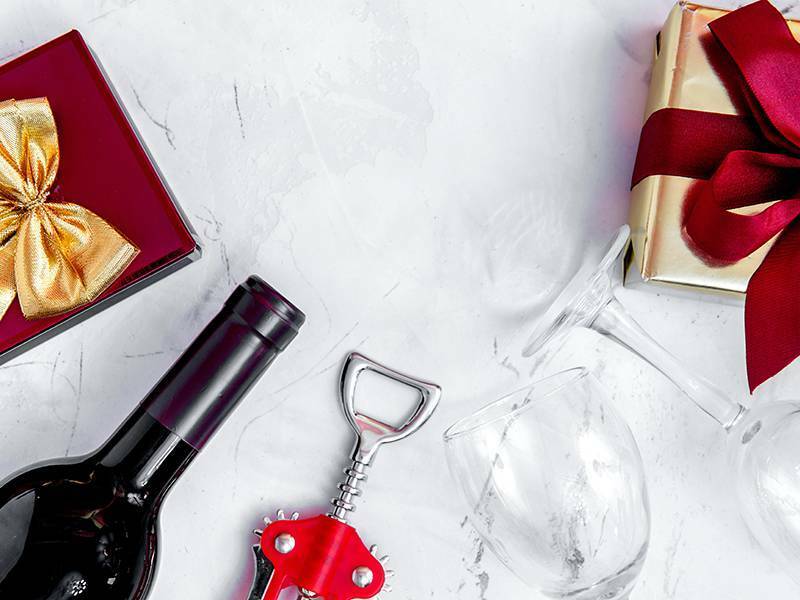 Give the gift of wine and food - perfect for the person who likes to explore different wine and food pairings each month. Wine club membership comes with a four-compartment, insulated wine tote bag and our monthly selection of wines and food pairings.